Curious about how xVelocity can help with your columnstore indexes? Check out this tip from Basit Farooq to find out. With the release of SQL Server 2012, Microsoft introduced a new type of nonclustered index called xVelocity columnstore index in the SQL Server database engine. It is based on VertiPaq in-memory data compression technology. The xVelocity memory optimized columnstore indexes are one of the most significant performance and scalability enhancements in SQL Server 2012. The xVelocity columnstore indexes speed up the processing time for common data warehousing queries -- particularly in situations where very large quantities of data have to be aggregated and accessed quickly. According to Microsoft, under certain conditions, the xVelocity columnstore index provides queries with speed improvements of 4X, 10X or even 100X. Before designing, implementing or managing a columnstore index, it is beneficial to understand how these indexes work and how the data is stored in a columnstore index. How does an xVelocity columnstore index improve query performance? xVelocity columnstore indexes are based on VertiPaq in-memory data compression technology, which usually improves the performance of database warehouse queries. The VertiPaq in-memory data compression allows a large amount of data to be compressed in-memory; this results in the query requiring less I/O because the amount of data transferred from disk to memory is significantly reduced. Next, execute the following script to drop the existing nonclustered index and replace it with the columnstore index. 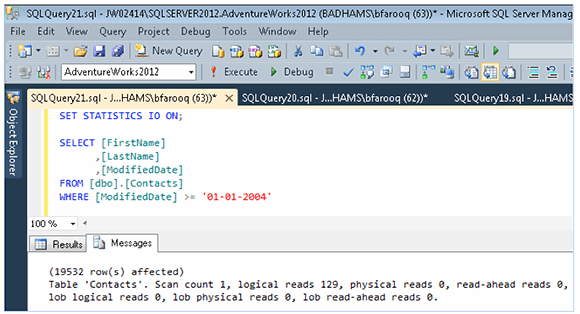 The directive COLUMNSTORE instructs SQL Server that this will be a columnstore index. Alternatively, we can use Object Explorer in SQL Server Management Studio to create this columnstore index. 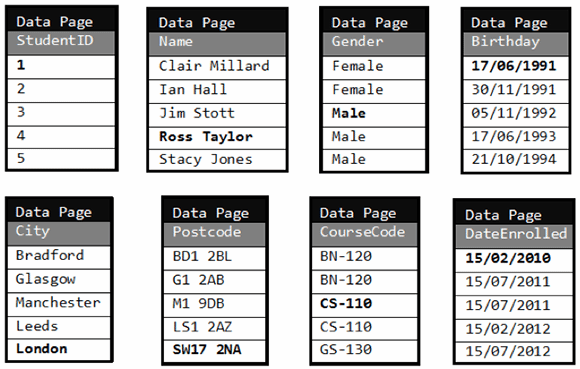 To do that, expand table and right click Indexes. Then choose a New Index and then Nonclustered columnstore index. As you can see, compared to a regular nonclustered index, the columnstore index on dbo.Contacts table significantly improves the query disk I/O. 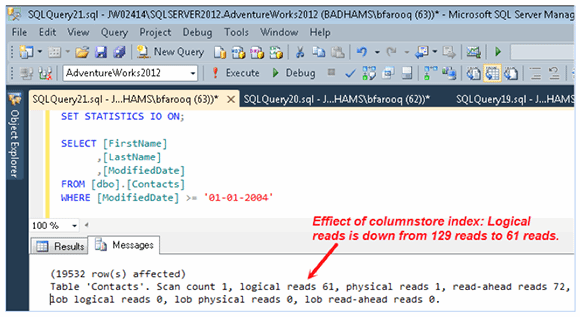 The columnstore index feature is only available in SQL Server 2012 Enterprise edition. Columnstore indexes cannot be combined with following features: Change data capture, change tracking, page and row compression and replication. A columnstore index cannot have more than 1024 columns. They cannot be set up as a clustered or unique index. They cannot be created over a View or Indexed View. Columnstore indexes cannot include sparse columns and they cannot act as primary or foreign keys for a table. Columnstore indexes cannot include columns with following data types: binary, varbinary, ntext, text, image, varchar(max), nvarchar(max), uniqueidentifier, FILESTREAM, xml, rowversion (and timestamp), sql_variant, decimal (and numeric) with precision greater than 18 digits, datetimeoffset with scale greater than 2 and CLR types (hierarchyid and spatial types).